We design, build and or sell the supplies and handle insulation, tubing, manifolds, valves, temp sensors and boilers. 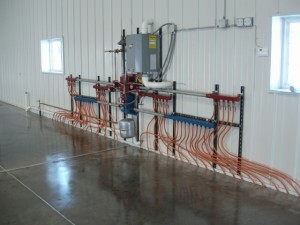 Hydronic systems use water or a mix of water and anti-freeze as the heat transfer fluid in a “closed loop” that is recirculated between the floor and the boiler. Various types of pipes are available specifically for hydronic underfloor heating and cooling systems and are generally made from polyethylene including PEX, PEX-Al-PEX and PERT. Older materials such as Polybutylene (PB) and copper or steel pipe are still used for specialized applications. The use of modern factory assembled sub-stations, used primarily in district heating and cooling, can greatly simplify design requirements and reduce the installation and commissioning time of hydronic systems.